"We have stayed at Charles Mill Campground (Main) on numerous occasions both in tents and now a motor home. We absolutely love this place. The shower house is kept very nice and clean, the park is kept clean and has many activities (although I think some should be for the seasonal and paying campers ONLY), the rates a very good, it is very peaceful and the playground area is a wonderful place for my grandkids. My kids and grandkids love swimming at the beach and we have always had luck fishing. 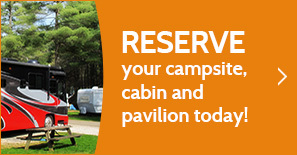 We are going to be seasonal campers this year - cannot wait for the season to begin :) "